God has given us a great responsibility and I want to share something God has given us to enable us to all these things. We need to be a trusting a praying people. We can’t do what God has called us to do without prayer. Mark11 :22 “Have faith in God,” Jesus answered. 23 “Truly[a] I tell you, if anyone says to this mountain, ‘Go, throw yourself into the sea,’ and does not doubt in their heart but believes that what they say will happen, it will be done for them. 24 Therefore I tell you, whatever you ask for in prayer, believe that you have received it, and it will be yours. The context is the Kingdom of God and his purposes. The Kingdom of God has come and there is a mandate to transform the nations. God has given us an access to a relationship with Him. This kind of relationship is there to move mountains. It talks about your blessings as well. There is a promise and a prayer. Let’s be a movement of mountain movers. There is a response required. 1. Whatever you ask! What does that mean? Nothing is excluded. If this is true, our prayer meetings will be full and God is going to give us whatever we ask. 2. Believe. This is key. Whoever doesn’t doubt. He taught us the prayer, which says your kingdom come. It is a prayer that must happen. The kingdom of god is with you .If you believe you will ask because you know it is there. God has things for us but it is dependent on what we ask for. James 5:15. 15 And the prayer offered in faith will make the sick person well; the Lord will raise them up. If they have sinned, they will be forgiven. When we pray in faith something has to happen. 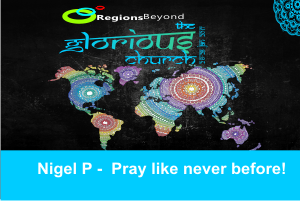 Pray continually. We need to be a people of continual prayer. 2Kings 20:5 5 “Go back and tell Hezekiah, the ruler of my people, ‘This is what the Lord, the God of your father David, says: I have heard your prayer and seen your tears; I will heal you. On the third day from now you will go up to the temple of the Lord. Is 38:5 Go and tell Hezekiah, ‘This is what the Lord, the God of your father David, says: I have heard your prayer and seen your tears; I will add fifteen years to your life. It is so exciting to see this. God heard his prayer. When we pray, he is waiting to hear and to do. Some of these discovered a secret of obtaining the things promised. Accessing the things God has promised. It lies unused by many Christians. We need consistent and persevering prayer until the promise comes. Prayer is rooted in the promise of God. Prayer is not a formula it’s a relationship with God. 2Chron 7:14 if my people, who are called by my name, will humble themselves and pray and seek my face and turn from their wicked ways, then I will hear from heaven, and I will forgive their sin and will heal their land. God wants us to encounter Him. We are meeting with God to seek his face and turn from our wicked ways. God reminds us in prayer of things we need to do. God is hearing our prayer. You, were chosen and saved to have your prayer answered. When we know this, we push and we pray. We keep doing this out of confidence that the promise of God will come. We are called to go from victory, to victory. How do our prayers get answered? Rev 5:8 8 And when he had taken it, the four living creatures and the twenty-four elders fell down before the Lamb. Each one had a harp and they were holding golden bowls full of incense, which are the prayers of God’s people. Here the 24 Elders were holding the prayers of the saints. Rev 8:4 The smoke of the incense, together with the prayers of God’s people, went up before God from the angel’s hand. It gives us a glimpse of what happens with our prayers. When God wants to do something through you and I, it requires that we keep persevering till the tipping point when god does something. You have to keep praying because you know it’s God’s will. We prayed for barren ladies (some were barren for seven years) last year four of them gave birth. The devil wants you to think that the answer won’t come. Don’t quit. God has your case. Luke 18 The parable of the persistent widow. The weakest person in society, a push over. She goes to the judge for justice. He was a judge who did not care. But she goes again and again. She did not give up. Jesus is telling us this story to teach us how to pray. How much more will God give us what we ask for? So, will he find faith like the widow – faith that never gives up. Can our life be filled with this kind of persistence? Psalm Delight yourself in the Lord. God wants to gives us things. The prayer of a righteous person is powerful and effective. God will do things for us when we walk righteously. Elijah did not stop. What makes Elijah prayer again and again? He now something. He knows this the will of God. He prays because he know it will come. We see this with Abraham as well so the sake of 10 people in Sodom and Gomorrah we have to pay and it will be said of us that God heard their prayers. Sometimes prayers don’t get answered because we give up. This is the secret. We must continue to pray. James 4:15 Instead, you ought to say, “If it is the Lord’s will, we will live and do this or that.”. Sometimes it’s not God’s will. But let’s be a people of prayer. We cannot continue praying like we used to which fifteen minutes on the train etc. We need to make time for prayer. Jesus knew this and kept praying.